I'm playing a game with a strong female protagonist in an apocalyptical open world where humanity faces an uncertain future while fighting a horde of mysterious machine controlled by an unknown force that threatened its existence. Nier:Automata Horizon: Zero Dawn has been consistently rated as the top game for the PS4 in 2017 if not the top video game for 2017 overall. My SO told that it was time for me to move pass Nier:Automata and 2B so I looked for another game. Horizon: Zero Dawn has been on my list for while so that's what I chose to play following Nier and while I was obviously poking fun that I went from one game to what might seem to be another similar game I just want to clarify that these two are completely different games that's only superficially similar in that it uses the post-apocalyptical world as a setting. Horizon: Zero Dawn is a graphically gorgeous game. It can be fun just going around the world and sight see the beautifully rendered landscapes. It adds to the world a cast of characters that are admirable and captivating. It offers a well paced story with intriguing mysteries that reveals itself at a nice pace as you progressed through the game. Its side quests have relevance and makes it worthwhile to do. While the world of Nier:Automata invokes a more melancholy feel mixed with hope, Horizon's world is more forthcoming in its optimism. The story line of Horison is a lot less complex (and some parts more predictable) then that of Nier, it is still entertaining and kept me wanting to know what each new chapter will reveal. Where Nier is more subtle in its characters' personalities, Horizon is more candid. This works for ZD and is better for it. The main protagonist isn't meant to be subtle. She is smart, independent, skilled and not easily intimidated. She is meant to be a leader and when recognized as such by the other characters it is convincing. The game play is fun and action oriented although stealth is also highly prized. Anyone who's played the recent Tomb Raider will see the similarities. Having to find the grip to jump/grab to takes too much time. This isn't puzzle solving but more "Where's Waldo?". I find this distracting from the game. While the graphics are beautiful, the facial animation were clearly very computer generated. It also took away the immersive feel when once they open their mouth it takes the player back to reality of a digital doll with moving mouths. The default control settings especially Dodge and cancel. I don't know how many time I am cancelling out the menus only to push the squre button one too many time and dive to something I didn't want. Still on the topic of controls, it didn't feel as natural (e.g. instead of pulling back to stop your mount). Despite these minor complaints, Horizen is a must play for PS4 owners. I thoroughly enjoyed it and would recommend it even though I still have Nier as my game of the year. 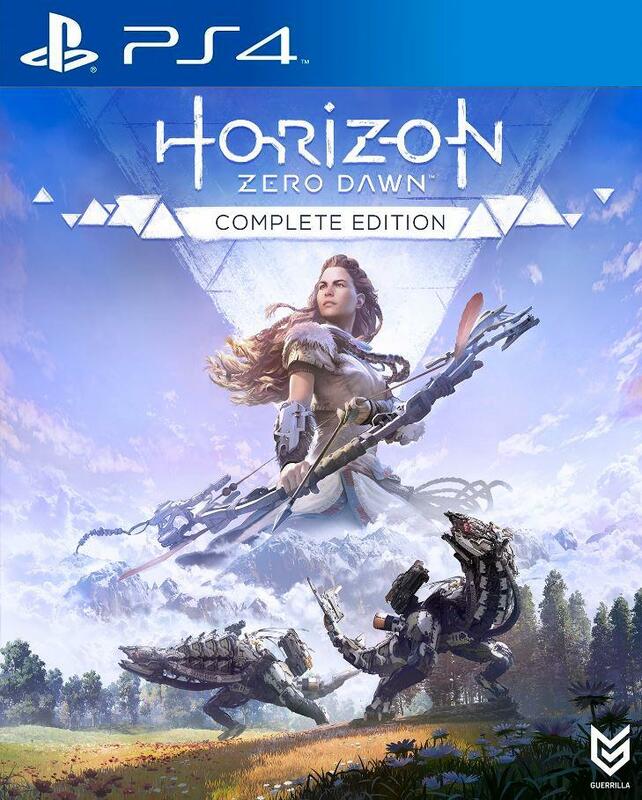 With the release of the complete edition, both the game and DLCs are together in one place.